Have you tried to find babysitters for New Years? have you seen how much it costs? Have you tried dragging along tired children to a New Years party? One word..HORRENDOUS! I have 3 young children and they are as keen to celebrate this occasion as I was at their age. I admit to having mommy guilt about leaving them home and going out partying AND we all know what going out late means, late to bed..and children DO NOT, I repeat, DO NOT care that you got home late and that you are not happy about getting up at 6am. I have decided it is just not all that important anymore and that the residual effect of a night out is just not worth the agony of trying to occupy 3 kids happily on the 1st on very little sleep. So, this being said, what can you do to make New Year’s Eve a great family friendly night in that everyone can enjoy. Firstly, as our are still young (eldest is 8) we have new year’s at 10pm. That way they fell like they are having a later night and as such a treat. And we get around 2 hours after they go to bed to ourselves seeing the new year in with some bubbly. I like to schedule activities from about 4pm til 10pm. An activity every 45 minutes or so. Depending on the length of time needed to complete each thing. 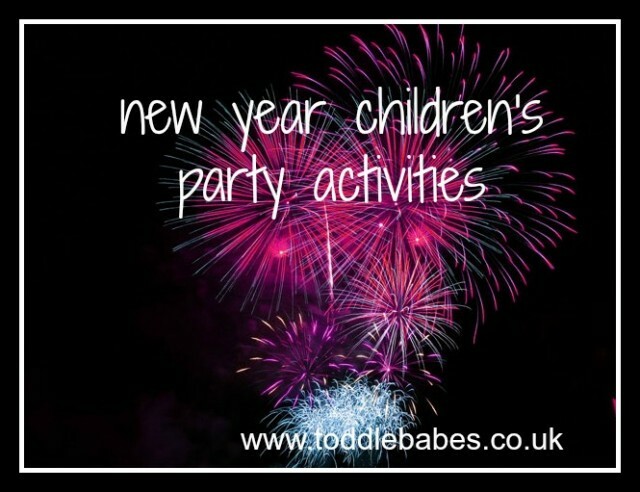 So what sort of things can you do for new year children’s activities? make a new year clock cake; one large circular cake with 12 numbered cupcakes around it. make noise makers out of empty bottles and rice. fill the bottles and close with a lid. Children can use stickers to decorate their bottle. make a family resolutions poster. Write each person’s resolution on the poster and stick it up somewhere to refer to during the new year. make a buffet of party food…better than a sit down meal and kids can keep grazing to help them stay awake! A chocolate fountain is always a winner. you can invite another couple who have small children to join in..but home time is 10pm. When it’s fake new year. We high five, cheer, sing a very poor version of Auld Lang Syne and drink a toast (kids get a soft drink). They like to clink glasses with us. Then it’s time for bed. Having the earlier time means that the children, although tired the next day, are not totally grumpy and moody and also feel included in this celebration. It means that mum and dad still have grown up time and it is a fun way for families to spend the end of the year together. I may sound ‘old’ by writing this, but I truly don’t miss heading out into the cold winter’s night to celebrate without my kids. Besides, before I can blink, they’ll be all grown up and they’ll go out for New Year’s Eve and we can go back to child-free New Year’s celebrations. Do you have any new year children’s activities you’ve enjoyed? I’d love to hear about them and add them to our list.